As you could've guessed, I bought more highlighters since my last highlighter focused post. Instead of just liquid highlighters like last time, I also got some more cream ones as well! I'll do an overview of my powder highlighters later, but the non-powder highlighters have been my go-to lately. If you've read my review of the Pony Effect Strobing Luminizer, you will know that I love this product. I started to use other highlighters on my cheekbones more, but I'm still using the Strobing Luminizer as a priming base like the Becca Backlight Priming Filter. It oddly subtly smells like a gentle man but I dig it. 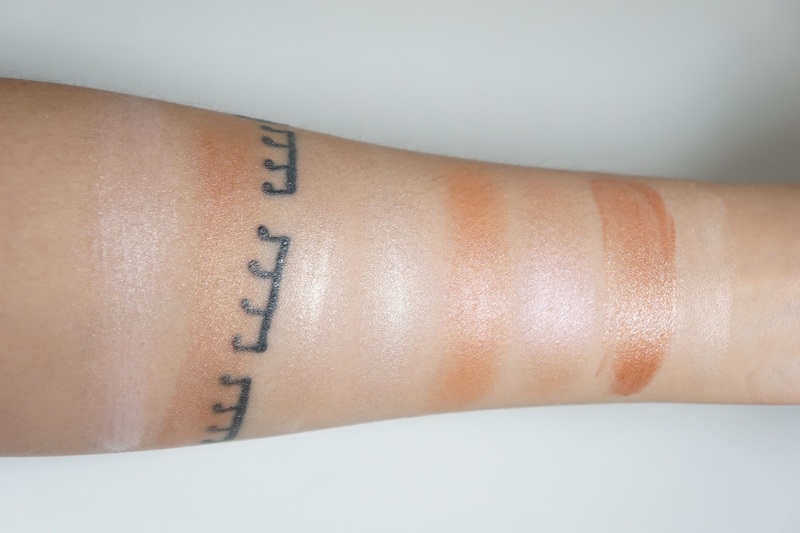 For more actual highlighting purposes, I've been really enjoying the Chosungah22 24H Raybeam Cream in Pink Glow and the Marc Jacobs Glow Stick in Spotlight. There's something about both of them that seem subtle and also very highlighting in a natural way. Considering that they're both light in tone, I'm pretty surprised how beautiful they look on my medium skin tone. 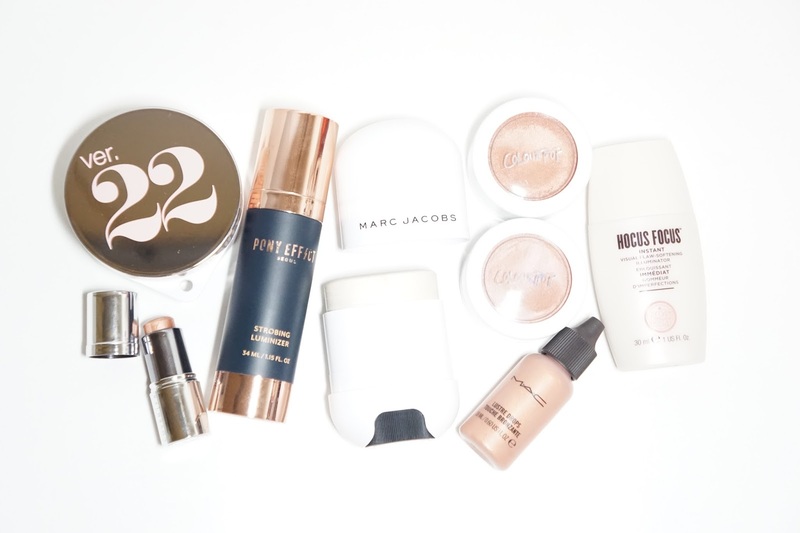 There is more shimmer to the Marc Jacobs highlighter and the Chosungah22 has a more dewy "I just moisturized" look to it. I've also been using the Cover FX Enhance Click in Rose Gold and MAC Cosmetics Lustre Drops in Barbados Girl, but they're not favorites? I like them but I just don't grab them as much. Both of them are more on the bronzey side though and so I do prefer using them with bronzer instead of highlighting. For Barbados Girl, there are also some noticeable glitter bits in it and so it's not as wearable as the other three I just mentioned. Onto the meh products that I have barely touched. I was pretty excited to try out the Colourpop Super Shock Cheek Highlighters and even though they're pretty, I don't like the texture. It feels thin and too slippery on my face and they fade faster than other cream highlighters I've tried. I was also pretty excited for the Soap & Glory Hocus Pocus Illuminator but I just didn't like it as much as the other liquid highlighters I have. There's nothing too special about it to me and I think I mostly bought it because I was excited to see Soap & Glory in person. & that's another round of highlighters! You would think that I would stop by now, but I actually just got another Cover FX Enhance Stick in Bubbly. The formula is so good, but my skin tone just didn't work that well with Rose Gold. 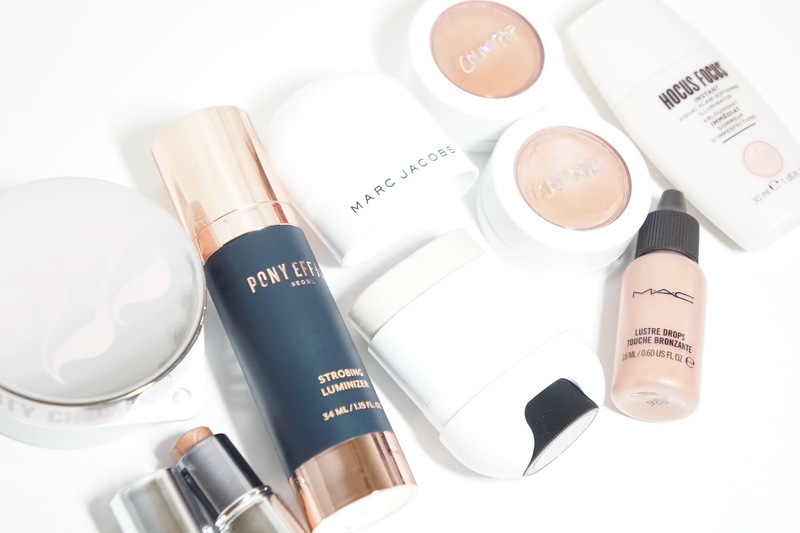 Did any of these highlighters catch your eye? *This item was sent to me for free through Memebox for reviewing purposes. I was not paid and all thoughts are my own.